Media talks, loudly, about Steve Bannon's call to "shut up"
What's Trump's most lethal weapon in his war against the media? Journalists responded to Steve Bannon's "shut up" comment with a word: "No." And with many other words. The anti-media sentiments from President Trump's chief strategist, which he discussed in an interview with the New York Times in which he also called the press "the opposition party," spurred hours of conversations and a swarm of tweets on Thursday. Groups like the Committee to Protect Journalists and the American Civil Liberties Union also weighed in. "Steve Bannon sought to provoke the media so any response risks playing into his hands," CPJ director Joel Simon told CNN. "Nevertheless, what needs to be said is this: This kind of speech not undermines the work of the media in this country, it emboldens autocratic leaders around the world. These leaders -- like Putin in Russia and Erdogan in Turkey -- have consolidated power by marginalizing independent media. We can't allow that to happen in the United States." CNN chief international correspondent Christiane Amanpour also invoked examples of other governments. On "Anderson Cooper 360," she said the Trump administration's strategy was "creating an enemy out of the press, and then dividing, diverting, obfuscating while other things are going on." "If I was going to be funny," Amanpour said, "I'd say that he's angling for an order of merit from president Sisi, Putin, Erdogan and all the others. That is how they treat their press. 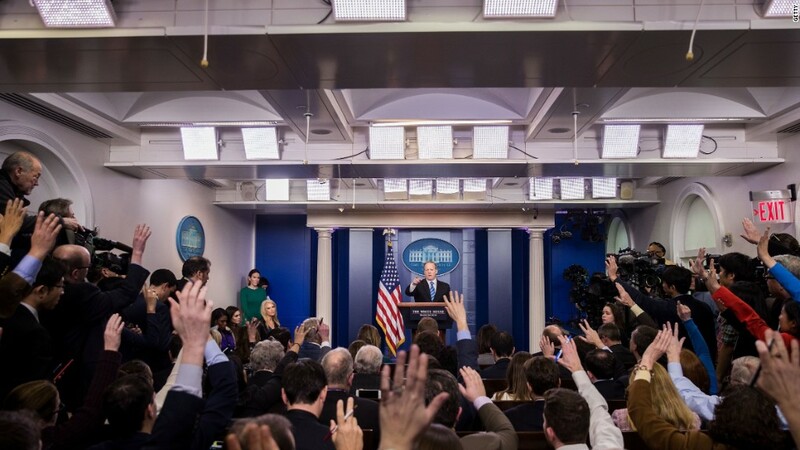 That is what they believe the press should be — a compliant propaganda state unit in the service of the president. It is not the tradition of the American press. So of course we're not going to shut up." Jacob Weisberg, the head of The Slate Group, tweeted that Bannon's comment was terrifying and "tyrannical." At the same time, there were cautionary notes, with some people urging journalists not to overreact or play into Bannon's hands. Washington Post media columnist Margaret Sullivan tweeted, "I strongly suggest that journalists do not take the Bannon bait, but buckle down to their core mission." Some people also said that Bannon didn't mean "shut up" literally, but that he was encouraging journalists to listen to the voters who elected Trump. After the election, many media critics urged humility and more thorough reporting about voters' opinions and motivations. "I think we should all learn to listen more to America, and I think that's probably Steve Bannon's central point," Trump senior advisor Kellyanne Conway said on PBS Thursday night. Conservative media critic MZ Hemingway told CNN that "Bannon basically just said completely obvious stuff that shouldn't be a surprise to anyone who was conscious for the last 15 months or so. Media failed. Big time. Sure, the left listened to the ever-increasing histrionics. The right completely tuned out. That's not a healthy place of for our media to be. Leaning into an oppositional stance, which is what is happening, only makes someone saying 'you're the opposition' even more obvious." At the same time, terms like "shut up" and "opposition party" led activists to raise alarms. "No, Stephen Bannon, the media should not "keep its mouth shut" and if the Trump administration tries, we'll see them in court," the ACLU tweeted. On "CNN Tonight," Carl Bernstein framed anti-media statements from the president and his aides not as a "war on the media," as Trump has said, but a "war on information." Thinking about the media as "the opposition" is not unprecedented. One of then-President Obama's top aides, Anita Dunn, said in 2009 that "we're going to treat them" -- meaning Fox News -- "the way we would treat an opponent." Appearing on MSNBC Thursday evening, Dunn suggested Fox's eight years of Obama coverage proved her right to do so. In any case, the Obama White House did not attack the entirety of the fourth estate on a daily basis. The Trump White House is. In an interview with Fox's Sean Hannity on Thursday, Trump deplored "fake news" reporting. During that same MSNBC segment, Dunn said "this is not a new tactic for Republicans," invoking Richard Nixon's attempts to tear down the media. CNN anchor Jake Tapper reported Bannon's "shut up" comment on his Thursday program, then simply said, "No." Separately, when interviewing anti-Trump conservative Evan McMullin, Tapper said his conservative friends on Facebook "seem very, very confused about what to believe any more. So I think that this idea that the president and his top aides are waging war on the media is a strategy, to make it clear that, in their view, you can only believe one person and that's Donald Trump, and you can't believe any of these other sources of information." "This is what authoritarians or leaders with authoritarian tendencies do," McMullin said.